This three bedroom split-level home is situated within Quadrant Wharf the exciting new phase at Millbay, Plymouth’s Coastal Quarter. The property will enjoy water views from the master bedroom as well as the fabulous living/dining and kitchen area and the West facing roof terrace to catch the evening sun. 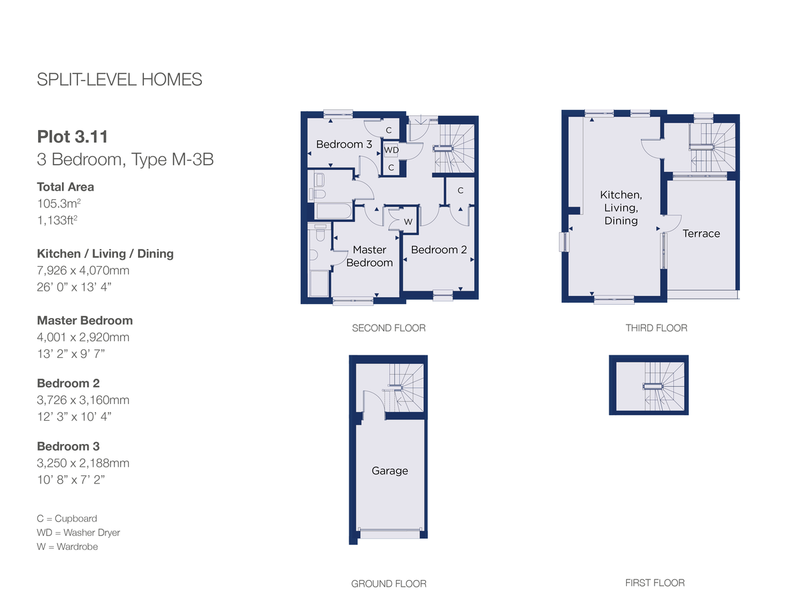 Split-level home, Three Bedrooms, Open Plan Living/Dining/Kitchen, En-Suite Shower Room, Bathroom, Roof Terrace, Garage and Parking Space. Quadrant Wharf is a development of one, two and three bedroom apartments and split-level homes is positioned next to the successful Quadrant Quay scheme, just a short walk from the bustling city centre and set close to King Point Marina home to the popular Dock restaurant. The development has been thoughtfully designed to make the most of its enviable coastal location. Master bedroom with large window to the front and water glimpses, built-in wardrobe and en-suite shower room. There are also a further two bedrooms on this floor both with built in cupboards and the family bathroom with tiled flooring along with Porcelanosa sanitaryware comprising floor mounted WC with dual flush plate, concealed cistern and soft close seat, wash hand basin with Hansgrohe mixer tap, panelled bath with thermostatic mixer shower, glass shower screen and full height tiling to walls around bath. Oak coloured laminate vanity unit with inset mirror, shelving and shaver socket. Chrome finish electric heated towel rail. From the hallway stairs led up to the fabulous open plan living room with pitched ceiling, large window to the front with water glimpses, area suitable for table and chairs and French door leading onto the wonderful roof terrace. The contemporary styled Mayflower fitted kitchen is located towards the rear of this room with satin matt cabinets and contrasting laminate worktops, upstand and glass splashback behind hob and under-cabinet lighting. Integrated appliances to include: multi-functional oven and induction hob, fridge/freezer and full size dishwasher. Also from the entrance hallway stairs lead down to the integral garage with automatic up and over door. OUTSIDE This split-level home benefits from a wonderful West Facing roof terrace, integral garage as well as an allocated parking space. SERVICES & TENURE Tenure: Leasehold 250 years from 22nd December 2006. Services: Mains Water, Electric and Drainage. Service Charge: £1358.00 per annum. Ground Rent: £350 per annum. Agents Note: All external images are CGI and are representative only.